The Italian is a popular one in my neck of the woods. On menus and at friend's houses. I like them with stone ground mustard, ketchup, and hot sauce. My husband thinks they rock with marinara, a la meatball sub. All flavors of these are DELICIOUS. I highly recommend them- I like to pan fry them until they are browned and eat them straight up as the main protein of a meal. If they were less expensive I would live on them. I am pretty picky about processed food but these have a great non-processed flavor and texture to them and no creepy ingredients. 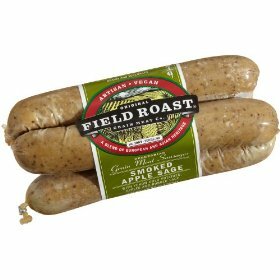 My boyfriend who's only been vegetarian for a few years also loves them and says they're one of the few faux meats that leave him feeling full. I also love all flavors of the Field Roast brand of fake meats. I almost never eat them plain, and I almost never add them to a meal w/o cutting them into small pieces and browning them in a skillet first (usually cast iron works best in my opinion). I do this b/c I think it improves the texture, makes it a bit crunchier. I add these to stir-fried veggies and all pasta dishes (lasagna, penne, spaghetti, etc.) Delicious!